Kid Success Rating: 3 out of 5 tomatoes. For L., it was really a 4 out of 5; he liked the meat very much and enjoyed the potato salad (especially the sundried tomatoes, which were a new food for him); but he wasn’t crazy about the carrot salad. For P., the ribs were a hit — he loves barbecue sauce, apparently. However, he balked at every single vegetable on his plate. Cost Rating: 3 out of 5 tomatoes. Having bought the ribs on sale, it wasn’t so bad. However, there are some touches in this meal that bump the budget up — like the sundried tomatoes, which aren’t super cheap. Also, it’s a pretty meat-heavy meal, all things considered, so if you can’t get the good stuff on sale, it’ll come out a bit pricier overall. Time to Table Number: Less than 15 minutes. That’s tonight’s tally, of course; literally, the time it took to get this on the table from the minute we walked through the door. 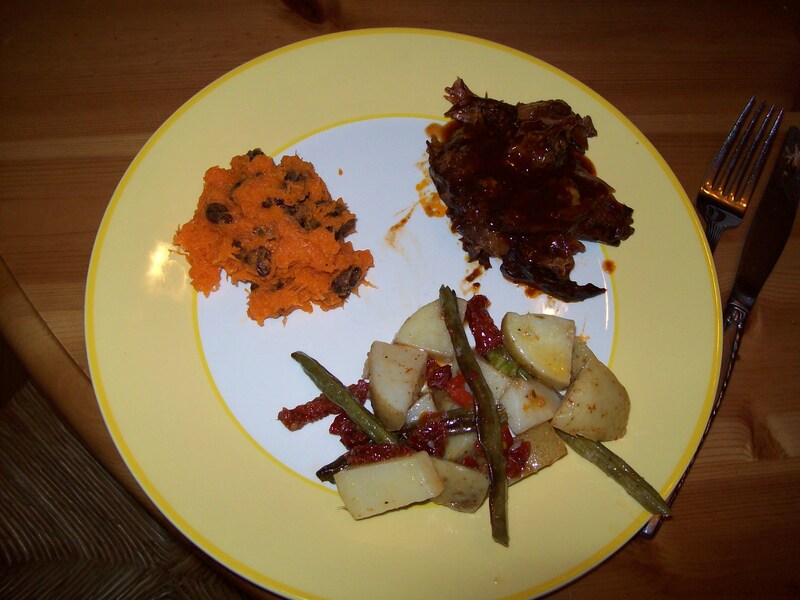 With the ribs done in the slow cooker, the potatoes cooked and tossed with seasonings the night before, and the green beans already roasted, I only had to assemble the carrot salad and the potato salad and plate everything up. The prep time was 20 minutes flat last evening — oven-roasting the ribs to seal the juices in and cooking the potatoes. Verdict? Tasted better than it looks in photographs; made my busy weeknight easier; and was actually pretty healthy, given the fact that there were lots of veggies on the table and all of the dressings were made with olive oil rather than mayo as would have been traditional. I also have to point out that because of the olive oil, the carrot salad and potato salad would both be totally picnic-friendly; something I think about quite a bit these days as I longingly gaze out the window hunting for a lasting stretch of warm, sunny weather! This entry was posted in Accountability, Cooking, Feeding kids, Meal planning, Parenting, Slow cooker and tagged cooking, family, feeding kids, food, Household organization, leftovers, meal planning, parenting, veggies. Bookmark the permalink. really liking these picture blog posts this week!